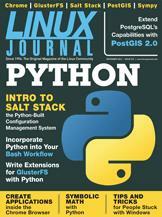 Learn how to use Python and existing UNIX tools to improve your productivity in the shell. GlusterFS is a distributed filesystem with a strong emphasis on extensibility. Now extensions can be written in Python, bringing significant performance and other improvements within reach of even more programmers. Install and configure software on multiple servers at once. Have the workhorse of GIS at your fingertips. Kyle Rankin's Hack and / What's Up Dock?